3.1 Plants to improve the main manifestations of the ill nervous system. – Medicinal Plants: the use of appropriate herbal medicine can be very useful in the prevention or treatment of senile dementia. – Natural Foods: A proper diet will help prevent this disease. – Supplements: They will help to improve the conditions of the mind. – Improve the circulatory conditions of the blood vessels of the brain to prevent strokes that encourage the emergence of the disease or improve the blood supply to this organ, which will improve the functioning of this body. – To minimize some of the symptoms of the disease, such as depression, nervousness, insomnia, etc. 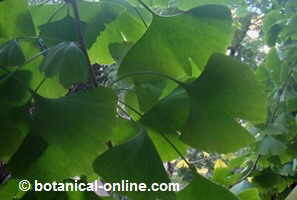 Ginkgo: (Ginkgo biloba) Poor circulation in the brain is the cause of many serious and crippling diseases. One of the most dangerous are strokes that can cause death or paralysis of any part of the body. Ginkgo extract improves circulation to the capillaries of the brain, increases resistance and helps to prevent breakage. The use of this plant can help improve symptoms of dementia and, some experts say it could even prevent its occurrence because it is able to to avoid brain vascular dementia, one of the main causes of the emergence of this disease. Wheat: (Triticum aestivum) the habitual ingestion of wheat germ, by its content in octaconasol, prevents the neuronal oxidation, protecting against the degeneration of the brain and the appearance of diseases such as dementia. Plants to improve the main manifestations of the ill nervous system.